Weekly Roundup: A Hilarious (yet smelly) Award-winning Children's Book! This week’s Roundup of Mom’s Choice Award winners is short, sweet and a bit smelly! 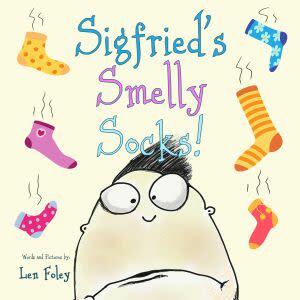 Sigfried’s Smelly Socks! is a hilarious story about a young boy’s search for why his book smells so bad…. The item you see below won a Mom’s Choice Award during November 26, 2017 to December 02, 2017. For more information about a product, click the product image or purchase link. Warning: Everyone says this book stinks! Hold your nose for this hilarious story about a young boy’s search for why his book smells so bad…. My grandson would absolutely love this book. My kids would totally get a kick out if this book! Sounds like a great book for me to get for my daughter’s class. She teaches first grade and we like to get books for her class to read. A humorous book goes a long way with first graders!